Was Scientific Dissent Being Quashed? The number is eye-popping, and it was repeated so often it became gospel. The snowpack in the Cascades, it was said, shrank by 50 percent in the last half-century. It's been presented as glaring evidence of the cost exacted by global warming — the drying up of a vital water source. That statistic has been repeated in a government report, on environmental-advocacy Web sites and in media coverage. Seattle Mayor Greg Nickels recently mentioned it in a guest column in The Seattle Times. Here's the problem: The number is dead wrong. The debunking of this statistic, and the question of just how much the state's snowpack shrank, is stirring up a heated debate among the region's climate scientists. Maybe the snow in the Cascade Mountains isn't in such immediate peril from global warming after all. Despite previous studies suggesting a warmer climate is already taking a bite out of Washington's snowpack, there's no clear evidence that human-induced climate change has caused a drop in 20th century snow levels, according to a new study by University of Washington scientists. A few years ago, several papers by scientists at the University of Washington (Mote, 2003; Mote, et al, 2004; Mote, et al, 2005) suggested that snowpack in the Pacific Northwest was declining due to global warming. "A study of springtime mountain snowpack in the Pacific Northwest showed widespread declines in snowpack since 1950 at most locations with largest declines at lower elevations indicating temperature effects." 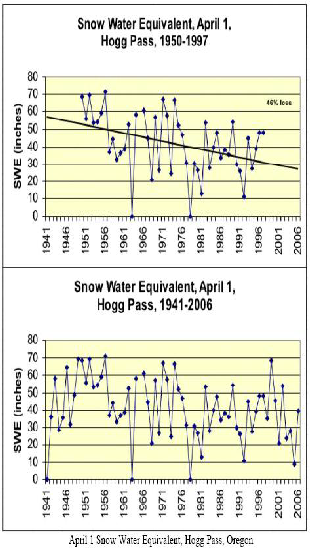 “The use of snowpack trends from 1950 through current suggests a much different (steeper) trend than if period of record measurements are used. Granted, there exist relatively few stations that extend back prior to 1940, but those stations whose records are available make it clear than monotonic decreases in snow pack do not occur through the entire period of record. Among the charts shown in the article were the following. 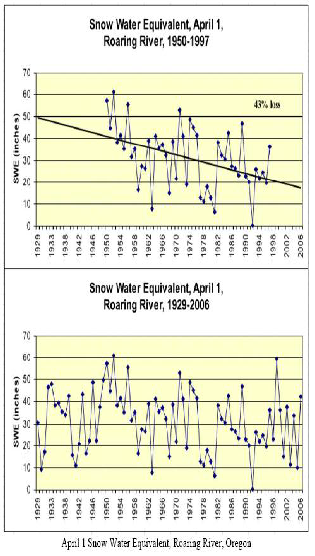 Each chart shows the 1950-1997 trend (the period used for the Mote et al papers) and a best-fit linear trend (including the percentage reduction in snowpack for the period). The second chart [bottom]shows the period of record through 2006. It is comforting that use of appropriate data records has dispelled some “bad science” conclusions. One hopes that policymakers will recognize this and modify their policies accordingly. Mote, P. W., 2003. 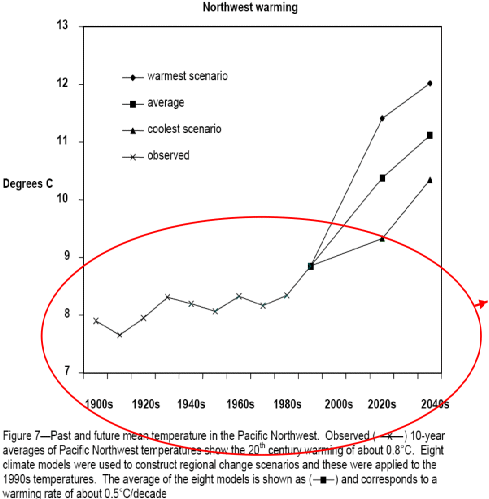 Trends in Temperature and Precipitation in the Pacific Northwest During the Twentieth Century. Northwest science, 77, 271-282. Mote, P. W., M. Clark, and A. F. Hamlet, 2004. Variability and Trends in Mountain Snowpack in Western North America. 15th symposium on Global Change and Climate Variations, Seattle, Washington. Mote, P. W., A.F. Hamlet, M.P. Clark and D.P. Lettenemier, 2005. Declining Mountain Snowpack in Western North America. Bull. Amer. Meteo. 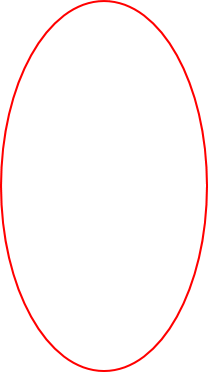 Soc., 86, 39-49. Temperature records also seem to be available. 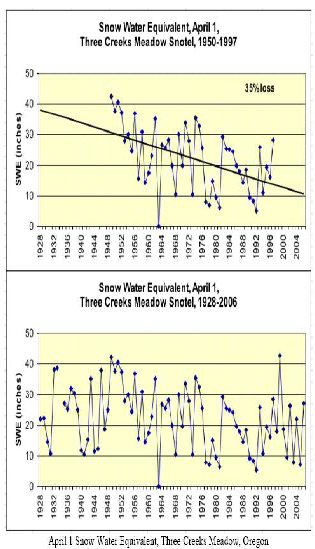 Maximum winter snowpack in the Snake River watershed has exhibited no trend upward or downward over the last 75 years. Scary, dramatic, part is just a prediction!